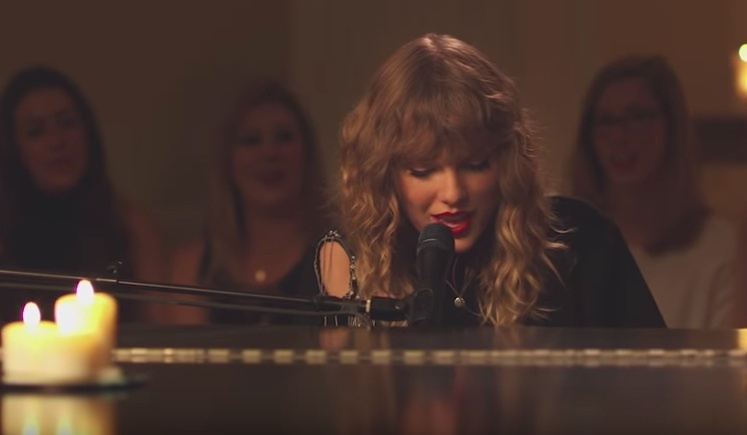 In perhaps the absolute best way to celebrate the release of her new album, Taylor Swift’s live, intimate rendition of “New Year’s Day” will make you seriously emotional on this fine day. In case you somehow missed it, Taylor finally dropped Reputation last night, and she marked the album’s release by performing the never-before-heard song during Scandal, which is pretty much the perfect blend of Swift and Shonda and we’re here for it. During a commercial break, ABC aired Taylor’s performance of “New Year’s Day,” and not only is it totally gorgeous, it marks the first time Taylor has performed a new song in three years…and it officially kicks off the Reputation era. “New Year’s Day” is the closing track on Taylor’s album, and according to RollingStone.com she performed the song in front of 100 of her biggest fans in the living room of her Rhode Island home during one of her “Secret Sessions” back in October. Taylor took to her piano to perform the poignant ballad for her Swifties, letting her vocals, piano keys, and the candlelit room set the scene. We know she said the old Taylor is dead, but this performance has us feeling like the very best parts of her are still alive and well. If you’re loving “New Year’s Day,” you can listen to it (and Reputation in its entirety) by picking up a copy in stores or purchasing the album on iTunes. It apparently be available on streaming services like Spotify and Apple Music in one week. And if you cannot wait for another Taylor performance, she’ll give her first live TV performance from the Reputation era during Saturday Night Live this weekend. We cannot wait!